Like Tad Williams, we tried to keep it to three parts, but it ended up being four. Below is Part Four of OstenArd.com’s interview with internationally bestselling speculative fiction writer Tad Williams, author of the “Memory, Sorrow and Thorn”, “Otherland”, “Shadowmarch” and “Bobby Dollar” books, and who recently announced the completion of the first draft of The Witchwood Crown, the first volume of a series of sequel novels to his classic “Memory, Sorrow and Thorn” trilogy, called “The Last King of Osten Ard“. The Witchwood Crown is tentatively slated for a Spring 2016 release. The below questions were asked by readers on the Tad Williams Message Board and by OstenArd.com contributors. In this part of the interview, we asked Williams about publication plans for print and audiobooks, plans for re-releases of the classic “Memory, Sorrow and Thorn” books, and what, if anything, he has found challenging about writing a much-older Simon, Miriamele, Binabik, and the rest of the crew. Tad Williams’ novels have long been available as audiobooks in Germany. Now “The Last King of Osten Ard” will get an English-language audiobook, Williams reveals. OstenArd.com: Tad, the new series will certainly be a major publishing event, and deals have been announced for the US and the UK. Are there any other deals in place that you can talk about? Have plans been put in place on how the new books are going to be published and/or marketed? Will there be audiobooks? 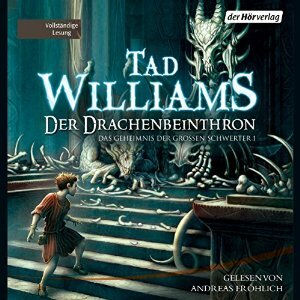 Tad Williams: I’m sure there will be audiobooks in English and German, although I don’t know any details yet. All other stuff, I really don’t know. Deb [Tad’s wife and business partner Deborah Beale] probably knows more than I do, because I’m doing my best just to get the books written. OA.com: Will there be re-issues of the original trilogy? Hardcover reprint? Audiobooks? Any news on that front? Tad: Same answer. But, yes, we’re pushing for a re-release. OA.com: In the “Memory, Sorrow and Thorn” reread on the Tad Williams Message Board, we had a lot of fun tracking down references to mythology/history/other books – can we expect more of that in “The Last King of Osten Ard”? Is there a reference you particularly liked in “Memory, Sorrow and Thorn” and that no one mentioned to you yet? Any still hidden Easter-egg? Simon and Miriamele gained a throne thirty years ago… How have their experiences changed them over the decades? OA.com: Were there any aspects of writing a 30-years-older Simon or Miriamele (or any other character from “Memory, Sorrow and Thorn” who reappears in “The Last King of Osten Ard” for that matter) that you found surprising or challenging or surprisingly challenging? Tad: Too early to say, really, because a lot of this will be not just who the characters are at the beginning, but how they change during these books, as they did during MS&T. But it’s all challenging, because we know these characters as young people. The difference between a teenager and a middle-aged adult is almost like two different people. But I think I’ll be able to tell you more when I’m actually done — rewrites and all — with this first volume, because it’s in rereading Witchwood Crown AS A NOVEL that will tell me a lot about whether Simon and Miriamele’s older selves feel real and appropriate.